Today, as I finished teaching math, I got oddly emotional. Luckily, our 60 minutes of math leads right up to lunchtime. So I dropped the kids off, and took 15 minutes to shovel my lunch down before the usual number of kids came back to finish work they hadn’t completed. During this time though, I realized why I was feeling the way I was. This was the last math lesson I’ll be teaching for a long time. In early March, I was elected the president of my association for the next three years. The presidency of my association, with roughly 2100 members, is a full time classroom release. That means I’m out of the classroom next year. This isn’t an easy thing to deal with. Since I was elected, I have been preparing to take over the reins in the coming school year. It’s been a lot harder than I thought it would be. I wrote in my first blog about what got me involved with my local association. I was advocating for a student who was having heat induced seizures and didn’t know where else to turn. It was that moment, and a president who saw that I had a passion for what was happening to my kids, that got me to the place I am today. It’s also why these next two weeks are going to be really hard. I got into this profession for one reason: I realized that I love being around kids. I love the relationships that teaching allows you to form with them. I love the daily interactions with my students. I love watching them grow, fail (and then learn from it), mature and become better people. The day-to-day minutia of teaching is what makes it so great. It’s the little things that matter. It’s the daily check-ins with kids and the feeling of making a difference in these kids’ lives. There is nothing that can replace the relationships, trust and bonds that I am lucky enough to form with my students each year. I know that this is something that even attempting to replace will be an exercise in futility. It’s losing these moments that have me most afraid of moving forward. These moments are the primary reason most of us got into the profession: improve the lives of our most important resource, our kids. I have been involved with my association for roughly half my teaching career. I had zero intention of becoming involved when I started. It was only through running out of options in advocating for my students that I understood the power of being part of a union. I had a wonderful conversation with IEA Vice President Kathi Griffin at the last IEA Summer Leadership Academy. (Shameless plug: If you have never attended SLA, I STRONGLY recommend it. It’s some of the most valuable sessions I’ve ever attended since I’ve been involved with IEA). She knew I was interested in taking over as president of my association when the current president retired. Griffin had some of the best advice I’ve been given since I’ve started. It is advice I plan on following once I start my new role on June 10. It’s also what makes Bruce Rauner’s attacks on us that much more infuriating. I got involved with my association because of kids. I have dedicated the last 14 years of my life to helping kids. I have also realized that our association supports kids and making our schools better. In the IEA-RA Rauner/Quinn Q & A, Rauner directly stated that unions and the public have divergent interests. This could not be further from the truth and I take personal offense to this statement. We don’t have to be diametrically opposed, philosophically speaking. Trying to keep the best people teaching our kids by giving them a fair wage and working conditions, which positively impact kids, isn’t something that’s against the taxpayers’ interest. It’s something that is in our state’s best interest. I got involved with my association by advocating for children. IEA leadership’s first piece of advice for me was to remember we’re here for kids. Our IEA RA was focused around issues impacting kids. In fact, next year there’s likely a spirited discussion headed our way regarding how Common Core is impacting our students. Don’t tell me what I stand for, Mr. Rauner. You have no idea. We are here for great public schools and that is in our state’s best interest. The association and the public do not, by definition, have divergent interests. We can stand for the same things: protecting our children by making sure they receive a great public education. I am done listening to people tell me what my association stands for. I know what I stand for, and I am a part of the IEA for a reason. I care about kids. I care about public schools. I care about education. The IEA does as well. Shame on Rauner and his anti-public education sycophants who don’t want to take the time to understand what we stand for. I am going to scream it to anyone who will listen. Our members need to do the same. My wife and I were talking a few nights ago and she expressed concern over how I was going to handle my new job without having the liberation and fun of getting to work with kids. I told her I will deal with it because my new job will still be fighting for them. While I won’t have the day-to-day interactions with kids that I love so much, I will be working to make our schools better for them. I don’t’ care what ALEC says we do. I don’t care what the Koch Brothers say we stand for. More importantly, I don’t care what Bruce Rauner says we stand for. I know what we stand for and I am proud to be a part of it. That won’t make the next 10 days any easier as I realize that everything that I love about education is going not be a part of my life come the fall. I know, though, that our association stands for kids and a great public education. That makes me feel a lot better, but I’m really going to miss my kids. I’m guessing what happened at the end of math is going to repeat itself more than a few times. As always, I love to read your comments and love to hear feedback. 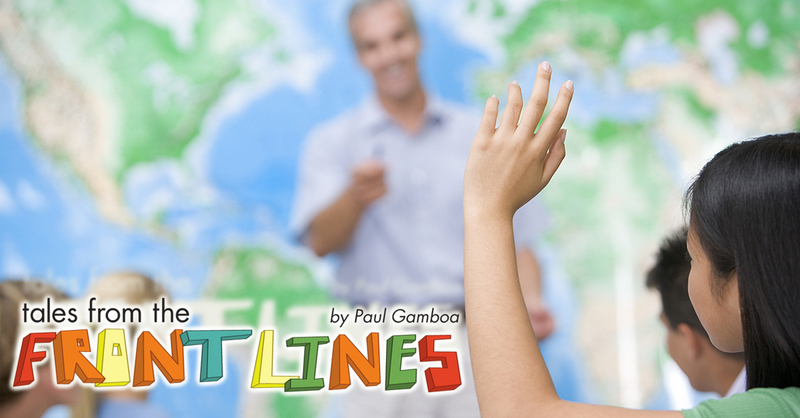 You can also give me feedback by following @paulgamboa on Twitter. Keep checking this summer because I look forward to continuing to talk about education and our schools (I’ll also have a lot more time not trying to deal with taking over the presidency and still managing my classroom J). Thanks for reading.